While the big players in the field of tree plantations gather in Sweden, EJOLT reports from the reality of their expansion in the South. The debates on sustainability seem to come from two different planets, until you realize that one planet is actually imposing its will on the other. It boils down to how you define sustainability: for people or for profit? Yesterday, the World Rainforest Movement received an appeal from Nitra Primiade, the wife of Anwar Sadat, the local WALHI director. She wants her husband to be released from prison. Anwar was beated and arrested weeks ago during a protest of peasants and he continues to be in jail together with peasant leaders. His crime: defending the rights of local peasant communities that lose their lands to the expansion of the plantation companies. As their mode of living heavily depends on forests, they are basically fighting for their very survival. WALHI knows about more than 100 of these conflicts in the region, all involving communities against companies. The same pattern of violations is visible in many other countries in the global South. Stora Enso, one of the biggest pulp and paper companies in the world, is involved in severe human rights violations around its eucalyptus plantations and cardboard mill project in Guangxi (China). Today, a press release was sent out to give visibility to a complaint letter, signed by a group of 11 NGOs, including WRM, to ask the UN Human Rights Council to seriously investigate the case. 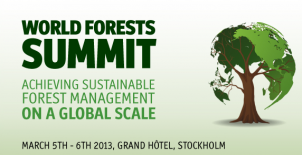 Meanwhile, today and tomorrow some major companies related to the pulp and paper sector meet in the World Forest Summit in Sweden. They are gathered around the motto of “Achieving sustainable forest management at a global scale”. But what can be learnt from the experiences on the ground is that industrial tree plantations are not forests. They are areas with one single tree that do not benefit people. They even steal their lands and jeopardize their mode of living. The only thing sustainable in this process is destruction for profit. If the World Forest Summit intends to discuss and achieve sustainability, one of the first steps would be to stop the expansion of industrial tree plantations in the global South, while attacking the unsustainable consumption of paper which drives the expansion of these plantations. The EJOLT report “An Overview of Industrial Tree plantations in the Global South: conflicts, trends and resistance struggles” (http://www.ejolt.org/2012/06/an-overview-of-industrial-tree-plantations-in-the-global-south-conflicts-trends-and-resistance-struggles/) indicates that the people in the global South do not demand for more plantations. Not even for sustainable monoculture plantations, as if that is possible. They demand for social and environmental justice and an urgent halt to human rights violations.